The Tao embodies the duality of the universe and the enlivening chi at work to balance opposing forces often represented by the tiger and dragon. Chinese mythology expresses these two forces of the Tiger and a Dragon, or yin and yang, as perfect complements. In feng shui, the dragon and tiger are important both inside and outside the house. 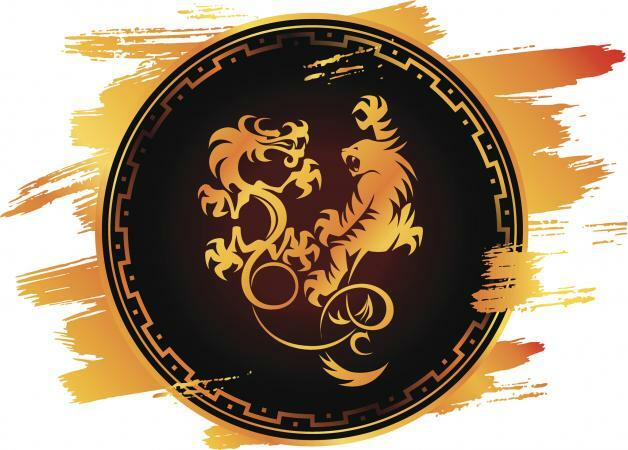 The Tiger and Dragon are Celestial Animals, credited in Form School feng shui with complementary energy and special status in landscaping for well-being and good fortune. The Tiger represents the yin or female chi, the direction West, the color white, and the element Metal. It is an embodiment of purpose and patience (much as a tiger deliberately and patiently stalks its prey). Its power is coiled and hidden deep within but a tiger can spring into action with transformative, even deadly force at will. Tiger is assigned to the right side of your property as you face out from the main entrance. That part of the environment or landscape should be lower than the left side because the Tiger is an earth creature and more grounded than the Dragon. Dragon energy is male, bold, extroverted, and sky-centered. The green Dragon's direction is East and its element is Wood. When evaluating the landscape, Dragon is located to the left of the property as you face out from the front door. This area should be higher than the right side of the property. Features might include a hill, a slope, an extra story, a raised porch, or a tall tree. 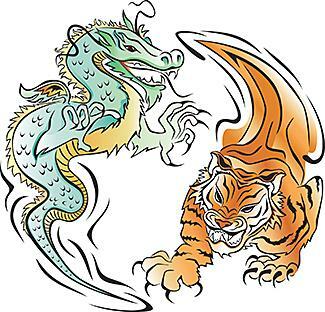 The Dragon is fiery and destructive but its force is tempered by the Tiger energy. So, the yin-yang of these two powerful creatures creates a perfect balance. Compass School feng shui reverses the orientation of the Tiger and Dragon. So you may see the Dragon on the left or West of the circle, facing East, and the Tiger in the East or right side, facing West. The Celestial Animals retain every bit of their fierceness, no matter which school employs them symbolically. The tension between them is the tension of the forces of light and dark in the world, each holding the other in check. It's possible to improve your personal chi by studying the orientation of the Tiger and Dragon and applying it to your furniture placement. Position your seating so the wall is at your back to gain the support of the Dragon energy. Sit opposite, but not directly across from, a door. This allows you to receive the Tiger energy flowing into the room without receiving it forcefully enough to interfere with your concentration. This is a good placement for a chair, couch or even a desk. Using feng shui orientation, summon Tiger energy indoors with an end table, small bookcase, nightstand or cabinet to the right of seating or the bed. This placement of a low object evokes the Tiger essence of security, especially if the object is white or metal. Place a plant or some other greenery to your left to encourage the Dragon to occupy this space. Ideally, the plant will grow upward, tall and vertical or raised on a stand to give it greater height. This taller object in the classic Dragon direction reinforces a power position with a sense of clarity and a tendency to action. Draw the yin-yang energy of Tiger and Dragon into your life with framed paintings or sketches, jewelry, sculptures or other representational art. Feng shui your landscaping to emphasize aspects of Tiger and Dragon power surrounding your home. The mythical and the real creatures are both magical and majestic. Allow that energy to infuse your environment, attracting more positive chi and balancing all the forces of light and darkness around you.